I've never had the kind of money set aside where I could do random large donations to charities or non-profits that represent something I believe in, so to offset that lack I've always tried to be generous with my time. I've volunteered at many organizations here and there throughout the years. Since starting HaldeCraft, though, while having my eye on a couple of different agencies I'd like to be volunteering my time with, regretfully I don't have the time. But I do know of a non-profit group here in town that takes donations, and some of the things on their wish list are things that I can make. Peaceful Paths is a Domestic Abuse Network here in Gainesville, Florida. They offer everything from support groups and counseling to legal help, education/mentoring/job services aid, and of course, an emergency shelter. When women and children leave their homes to go to an emergency shelter, it's not like ... not like packing to go on vacation. You don't take everything you need with you. Donations of new, unused items can make women and children feel less on the run, more stable, more capable. More cared for, and when you feel cared for it's easier to care for others. With that in mind, I'm proud to say that HaldeCraft can reach out a little and give some good, clean comfort. Starting this month, October, Domestic Violence Awareness Month, for every ten bars of soap sold at HaldeCraft, I'll be donating one bar to Peaceful Paths, adding them up throughout the months and donating once a quarter. But the first donation is a catch-up from everything I've done so far this year, and so far in the three quarters of 2013, I've sold 303 bars of soap... this weekend, I'll be donating 30 bars of soap to Peaceful Paths, in a fragrance that I blended just for this batch. 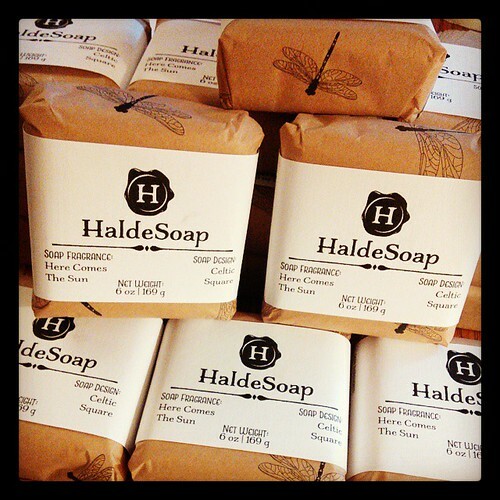 Thank you, HaldeCraft supporters (and soap users, heh). Because you support me, I can support others. And that's how we all make it in this world. I’m extra glad I just ordered a bunch of soap, heh. ‘Here Comes the Sun’? I love it!